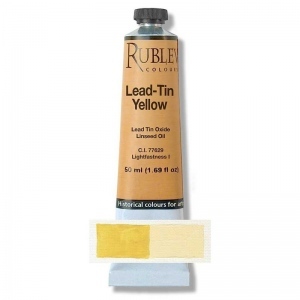 Rublev Colours Lead-Tin Yellow (Type I) is an opaque lemon yellow, fine grained and medium tinting strength. Our lead-tin yellow is made according to historical recipes. Although lead-tin yellow frequently occurs in European painting before the eighteenth century, it is not mentioned in older literature on painting techniques. It has been identified in Rembrandt's work such as Belshazzar's Feast (1636/1638). It is called massicot in northern European manuscripts, but identified as giallolino or giallorino in Italian manuscripts, as noted by Merrifield. Lead-tin yellow has not been rated for lightfastness by the ASTM, but independent studies have shown that it is permanent in most vehicles and can be used with all other pigments without alteration.